I wrote this review while participating in a program on behalf of HP and received a Walmart gift card as part of my participation. A few weeks ago I talked about all of the great HP Photo Products that are available through Walmart's Photo Center, and how I was going to use them to wake up my walls." 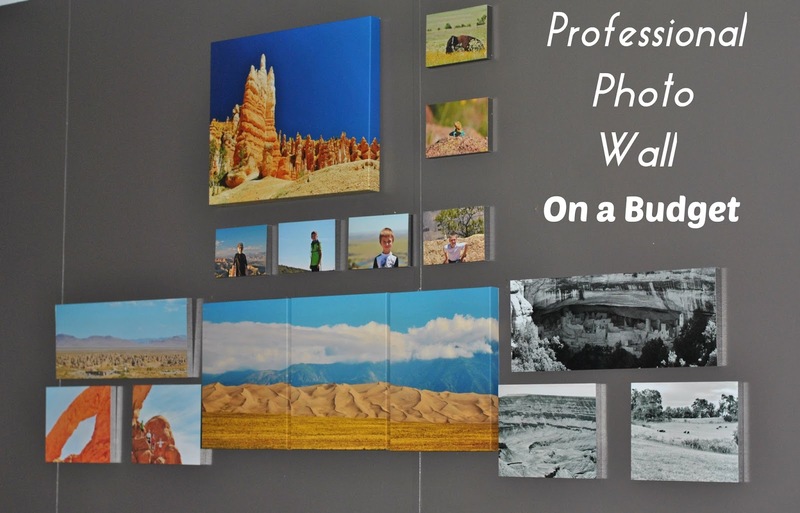 Walmart has a wide range of HP Photo Products available for 1-hour and same day service, including Multi-Panel Canvases, HP Mounted Photos, HP Faux Canvases, and HP Premium Canvases. I used a combination of these items to create a professional quality photo wall full of our summer camping trip memories on a budget. I don't know if you've priced out photo canvases before, but boy are they pricey. Just like everything else though, Walmart has amazing prices on them! I purchased a stunning Multi-Panel Canvas of a shot I took at Great Sand Dunes National Park as the feature of my photo wall. This was my big splurge, but still a bargain for three 11"x14" photo canvases for only $69.96. I then purchased a variety of 5x7, 8x20 and 8x10 mounted photos, ranging in price from $8.96-$12.96. The mounted photos are an incredible value, and they are ready in just one hour. They give you the mounted look of a canvas with polished silver sides, at a fraction of the cost. I finished off the photo wall with a 16x20 HP Faux Canvas of a beautiful shot from Bryce Canyon. If you want something that truly looks just like canvas at a great discount, these faux canvases are for you! For $29.96, I got this large faux canvas that looks just like the real thing, but is actually wrapped around a cardboard frame. All of the items came ready to hang, making it super easy to put my photo wall design into play! Ordering my photos was as simple as going into my local Walmart store, sitting down at one of the photo product machines, inserting my SD card, and selecting the items and sizes I wanted. A printed claim ticket led me to the printing machine to pick up my prints for the mounted photos. These printed in a matter of minutes, I took them to the photo counter and the customer service agent there had them made in well under an hour! The next afternoon I returned to pick up the rest of my order. Easy peasy! I could not have been happier with my HP photo product purchases from Walmart, and I am thrilled to have ended up with a professional photo wall for less than $250! If you want to bring your summer memories to life with amazing HP Photo Products like these, you can head to your local Walmart, or order from Walmart.com online. The 1-hour and Same-Day services mean instant gratification at a great value! You had so many great photos from your camping trip to choose from - how did you ever decide?! What a great way to relive the memories for you and your boys to see these on the walls! What beautiful pictures you took! They look super professional. I'd love to do this in my own home as it makes the wall pop with color! Those look really nice. If only I had some photos of awesome places to hang. I love this idea! And you have this beautiful photo wall as a memento of your wonderful summer! What a great and easy way to display your favorite photos. Gorgeous photos! You did a great job! What!? This seems so simple and I always thought it was a lot more work .. I love what you did and the photos are perfect! I love canvas prints! I'm hoping to get a few of my children soon. I have it on my to-do list to make a photo wall. The hardest part is picking out the photos. It looks beautiful I love how you split some of the photos. Your photos look amazing and very detailed! I have so many photos I need to enlarge and frame. I would love to do something like this for our hallway. I really love the way that came out. That wall is beautiful! I have never ordered a canvas print from Walmart but it looks like I really should! Those came out amazing! I love the rock formation in two photos, they're aligned perfectly and it looks awesome. THat is awesome and for a great price too! It's nice to know that they are so affordable. I love the look of canvas prints on a wall. I love this setup! I would like to duplicate something similar in our upstairs hallway.